JL Audio SB-GM-HUMRH2/12W6v3/TN, You make a statement with your vehicle, now you can make a statement with the way it sounds. 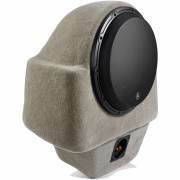 This Stealthbox® houses a premium, JL Audio 12-inch subwoofer, capable of filling the H2 with superb bass. The Stealthbox® is designed to fit on top of the driver’s side cargo area trim panel where it won’t interfere with cargo or the spare tire. The Hard Data: Contains one 12W6v3-D4 subwoofer in a sealed enclosure. 600 watt power handling. Wired for 2 ohm mono. 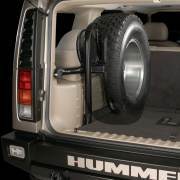 Installs in the driver side rear cargo area on top of the side panel and behind the spare tire mount (if so equipped). A steel mesh grille is included. Minor modification of interior spare tire holder (if so equipped) is necessary, driver’s side storage pocket is lost. Will not fit Hummer H2 SUT or H3.